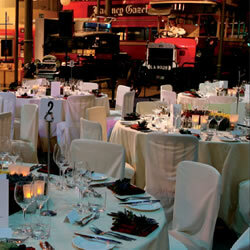 From large receptions to intimate dinners, the gallery spaces and Cubic Theatre provide a unique backdrop for business gatherings, product launches, award ceremonies and private celebrations. The spectacular contemporary galleries mix the old and new with stunning displays featuring iconic transport posters and original artworks, vintage public transport vehicles and exhibitions that look at future developments on London’s transport system. 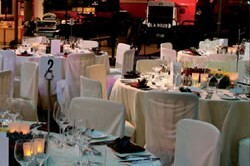 In the evening, the Museum transforms into a dramatic venue in which to hold corporate and private events – up to 500 people for a drinks reception, or 180 people for a seated dinner. Your guests will arrive via the impressive multimedia World City gallery and will have access to the entire Museum. They will be drawn to the central, visually striking ‘Connections’ exhibit, which is visible from most of the gallery spaces, and which can be used to project your own corporate messages and presentations. The Cubic Theatre seats 120 people and has state-of-the-art presentation technology and a dedicated foyer area for meetings and entertaining. It is fully accessible and can be hired separately from the main Museum.